All the mainstream cruise lines except Carnival have private islands or parts of islands that are included as a port of call on many of their Caribbean and Bahamas itineraries. While few have any true Caribbean culture, they do allow cruisers a guaranteed beach day with all the trimmings and a more private experience than enjoyed at most ports' public beaches. Note that aside from Disney's Castaway Cay, none of the islands has a large dock, so passengers are ferried ashore by tender. Most of Princess's eastern and western Caribbean itineraries stop at Princess Cays, a 40-acre beachfront strip off the southwestern coast of Eleuthera in The Bahamas, which is basically cut off from the rest of the island. The half-mile of shoreline allows passengers to swim, snorkel, and make use of Princess's fleet of Hobie Cats, Sunfish, banana boats, kayaks, and pedal boats. (If you want to rent watersports equipment, be sure to book while aboard ship or even online, before your cruise, to ensure that you get what you want.) There's also a beach barbecue -- though don't look for live music or massage facilities, as there aren't any. Those who want to get away from it all can head for the several dozen tree-shaded hammocks at the far end of the beach. For kids, there's a supervised play area with a sandbox and a pirate-ship-themed playground. The Princess shop sells T-shirts and other clothing, plus souvenirs of the mug-and-key-chain variety, and local vendors set up stands around the island to hawk conch shells, shell anklets, straw bags, and other crafts, as well as to do hair braiding. Many ships of sister lines Royal Caribbean and Celebrity stop for a day at one or another of the line's two private beach resorts, CocoCay and Labadee. Both have organized children's activities such as beach parties, volleyball, seashell collecting, and sand-castle building. At CocoCay (aka Little Stirrup Cay), an otherwise uninhabited 140-acre landfall in The Bahamas' Berry Islands, you'll find lots of beaches, hammocks, food, drink, and watersports, plus such activities as limbo contests, water-balloon tosses, relay races, and volleyball tournaments. Kids, both big and small, will like the aqua park with a floating trampoline, water slides, and a sunken airplane and schooner for snorkelers. The newest gimmick: Kids 3 to 8 can now hop in battery-operated mini race cars for what the line bills as a "special driving adventure" on the Fisher-Price Power Wheels Track. For something quieter, head for Wanderer's Beach; it's a longer walk from the tender pier than the other beaches, so it's usually less crowded and quieter. With calm surf and ultrasoft sand, it's perfect for families with young children. Labadee, an isolated, sun-flooded, 270-acre peninsula along Haiti's north coast, is so completely tourist-oriented that you'd never know it was attached to the rest of poverty-stricken Haiti. Labadee is a rarity among the cruise lines' private islands in that it gives you a real glimpse of island culture. At the straightforwardly named "Folkloric Show," a large, colorfully costumed troupe performs Haiti's distinctly African brand of dancing, drumming, and song; bands at the various bars and restaurants play the kind of acoustic guitar, banjo, and percussion "mento" music that was a precursor to reggae and other Caribbean styles. Five beaches spread around the peninsula are progressively less crowded the farther you walk from the dock, where enormous tenders make the short ride to and from the ship. For children, there's the pirate-themed Splash Bash area with water sprinklers, fountains, and spilling buckets. There are also floating trampolines, inflatable iceberg-shaped slides, and water seesaws. Kayaking and parasailing are enjoyed from a dock nearby. The latest rage is a 2,800-foot-long zipline called Dragons Breath that takes you over the water of Dragons Tail Beach. At the center of the peninsula, the Haitian Market and Artisans' Market are the port's low points, full of cheesy Africanesque statues and carvings, with touts trying to lure you in with "Sir, let me just show you something over here." Steer clear unless you're desperate for a souvenir. When we were here last, a painter near the dock had much more interesting work for sale. A port of call on all Disney Magic and Disney Wonder cruises, 1,000-acre, 3.2-mile Castaway Cay is rimmed with idyllically clear Bahamian waters and fine sandy beaches. Disney has developed less than 10% of the island, but in that 10% guests can swim and snorkel, rent bikes and boats, get their hair braided, shop, send postcards, have a massage, or just lounge in a hammock or on the beach. Barbecue burgers, ribs, fish, and chicken are available at Cookie's Bar-B-Q, and several bars are scattered around near the beaches. Recent enhancements include the barnacle-encrusted, 175-foot Flying Dutchman ghost ship anchored just offshore. An actual prop from Disney's Pirates of the Caribbean: Dead Man's Chest, which was filmed in Freeport, makes a whimsical backdrop for photos. The island's best quality is its accessibility. Unlike other private islands that require ships to anchor offshore and shuttle passengers back and forth on tenders, Castaway Cay's dock allows guests of Magic and Wonder to just step right off the ship and walk or take a shuttle tram to the island's attractions. Families can head to their own beach, lined with lounge chairs and pastel-colored umbrellas, where they can swim, explore a 12-acre snorkeling course, climb around on the offshore water-play structures, or rent a kayak, paddle boat, banana boat, sailboat, or other beach equipment. Teens have a beach of their own, where they can play volleyball, soccer, or tetherball; go on a "Wild Side" bike, snorkel, and kayak adventure; or design, build, and race their own boats. Parents who want some quiet time can drop preteens at Scuttle's Cove, a supervised children's center for ages 3 to 12, with activities including arts and crafts, music and theater, and scavenger hunts. An excavation site here allows kids to go on their own archaeological dig and make plaster molds of what they find -- including a 35-foot reproduction of a whale skeleton. Meanwhile, Mom and Dad can walk, bike, or hop the shuttle to quiet, secluded Serenity Bay, a mile-long stretch of beach in the northwest part of the island, at the end of an old airstrip decorated with vintage prop planes for a 1940s feel. You can enjoy 25- and 50-minute massages here in private cabanas open to a sea view on one side (sign up for your appointment at the onboard spa on the first day of your cruise to ensure a spot), and the Castaway Air Bar serves up drinks. Heidi sampled a piña colada and a deep-tissue massage at Serenity Bay while her kids were back in the nursery aboard the Wonder, and she gives it a giant thumbs-up. Adult- and child-size bicycles can be rented for $6 per hour. A newly lengthened bike/walking path lets you stretch those hamstrings, but don't go looking for scenery or wildlife -- at best, you'll see the occasional bird or leaping lizard. Parasailing can be enjoyed for $79 (45 min., airborne 5-7 min. ; over age 8 only). All-terrain strollers with canopies and beach wheelchairs are available free of charge. Located on the 2,500-acre Bahamian island of Little San Salvador, 55-acre Half Moon Cay is a port of call on most of HAL's Caribbean and Panama Canal cruises. The sand here is ultrasoft, so go ahead and lie right down in it or flop on one of the many beach chairs or under a blue canvas sun shade (though you'll have to rent it; they're in limited supply). Families will appreciate the water park at one end of the beach (closest to the tender pier), where there are three water slides on the sand for young children, as well as a couple for teens. Just offshore in the shallow turquoise sea, a cluster of floating toy animals -- including a crocodile, shark, and octopus -- are tethered to the sea floor and perfect for climbing. Other highlights of the beach area include massage huts as well as air-conditioned, beachfront cabanas available for rent (the regular ones accommodate four people and start at $249 a day, while a superdeluxe cabana for up to 25 people has a private bar, hot tub, water slide and a steeper price tag). A couple hundred bucks will buy you butler service and an open bar. Away from the main beach area and accessible via a short tram ride, shore-excursion opportunities include horseback riding (1[bf]1/2 hr., including a scenic trail ride and a gallop through the surf) and a visit to a 150[ts]75-foot water pen where you can pet and feed tame stingrays. You can also sign up for windsurfing, snorkeling, kayaking, scuba diving, deep-sea fishing, parasailing, sailboarding, or aqua-cycling. Half Moon Cay has lunch facilities, several bars, a playground, and even nature trails through a wild bird preserve at a remote part of the island. Passengers on Costa's eastern Caribbean itineraries spend 1 day at Catalina Island, off the coast of the Dominican Republic. This relaxing patch of paradise has a long beach fringed by palm trees, with activities such as volleyball, beach Olympics, and snorkeling. The area adjacent to the tender dock is the busiest spot, as is to be expected, but if you walk down the beach a bit, you'll get a quieter, more private experience (though the coastline gets a little rocky when you get farther away from the dock). Costa provides cruisers with floating beach mats free of charge (most lines charge for them), so you can find your quiet nirvana by paddling out to sea. A local island vendor rents jet skis and offers banana-boat rides, the ship's spa staff sets up a cabana to do massages on the beach, and locals roam around offering them, too. (For a fraction of the cost on ship, a local woman gave Heidi a great foot and shoulder massage.) Locals also sell coconuts for a couple of bucks apiece, first hacking off the end and plunking in a straw or two so you can drink the milk. After you're finished, take the coconut back and they'll whack the thing to pieces with a machete and scrape out the tender coconut meat for you to eat. Music and barbecues round out the day, and there's also a strip of shops hawking jewelry, beachwear, and other souvenirs. Note: On some itineraries, passengers must pay to hang out here for the day. 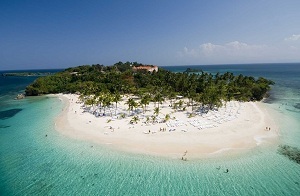 Most of MSC's Caribbean cruises spend a day in Cayo Levantado, a beach-rimmed, palm-tree-lined rainforest island off the northeast coast of the Dominican Republic's Samana Peninsula. As at all the other private islands, passengers can choose to flop on the beautiful white-sand beach, take a tour (including jeep safaris and a whale-watching cruise to see the humpbacks that winter here), or go snorkeling or swimming. There are beach chairs, umbrellas, and walking paths, plus tables for an open-air lunch; but you won't find a playground, hammocks, or massage facilities. One other difference: A day at this beach is considered a shore excursion, thus passengers are charged a flat rate if they want to play here. Unlike the other private islands in this section, Cayo Levantado actually isn't private at all: It's run by a Dominican company with whom MSC has scheduled port calls. The line also makes calls at the Dominican Republic port of La Romana, where passengers can enjoy the 7,000-acre resort Casa de Campo. NCL's private island, Great Stirrup Cay, is a stretch of palm-studded beachfront in the southern Bahamas, and was the very first private resort developed by a cruise line in the Caribbean. It's also the most cramped of the cruise line private islands, and part of the shoreline is very rocky. Still, after a piña colada -- or two -- you probably won't notice its flaws. Rest assured, the bar, lunch, and watersports facilities are hopping, as the sleepy beach turns into an instant party whenever one of the NCL vessels is in port. Music is either broadcast or performed live, barbecues are fired up, hammocks are strung between palms, and there's a definite beach buzz that takes over. Passengers can ride paddle boats, sail Sunfish, go snorkeling or parasailing, hop on a banana boat, join a game of volleyball on the three deep-sand courts, get a massage at one of the beachside stations (though they're not very private or quiet), or do nothing more than sunbathe all day long. For kids, organized activities include volleyball tournaments and sand-castle building, though there is no playground here.